Imagine a stereotypical small farm with a few chickens pecking around the yard, the sun shining on their bright red feathers. This image is close to the reality in Little Compton today, but for a few decades the town was the center of an international poultry industry built upon a local chicken known as the Rhode Island Red. The qualities that made this bird so popular didn’t occur by accident. Little Compton farmers bred the Rhode Island Red in response to a need for a meatier bird with more reliable egg laying capacities. Their success was the result of effective crossbreeding and innovations in hen-raising. The story begins far from Little Compton in Chittagong, Bangladesh. Local farmer William Tripp bought Chittagong chickens from a New Bedford sailor to breed with his own stock. These Asian chickens had the brilliant feathers and reliable egg laying for which the Rhode Island Red would become famous. This early form of the famous chicken developed a reputation among local farmers, and Isaac Wilbour, of Prospect Hill Farm, stopped by to see what all the fuss was about. Wilbour bought a few of Tripp’s marvelous hens and cross-bred them with local roosters, resulting in healthy, meaty hens with a prodigious egg-laying capacity. By the 1890s, Wilbour’s farm became the first large-scale poultry business in the world, exporting 150,000 dozen (1.8 million) eggs per year. To understand the scale of this operation, most other farmers at the time had fewer than 500 hens, compared to Wilbour’s 5,000. Other Little Compton farmers soon followed suit, and the town became the international poultry capital. In 1898, Wilbour also had the honor of naming the breed during a visit to his farm by two professors from the Rhode Island Agricultural Experiment Station - now the University of Rhode Island. This dominance did not last. By the early twentieth century, New England poultry farming, unable to compete with other areas of the country where feed and transport costs were lower, began to decline in favor of dairy farming. However, the Rhode Island Red and the techniques used to raise it continue to have a beneficial impact on New England farming. Today, most eggs with brown shells are produced by descendants of Little Compton’s Rhode Island Reds. In 1925, the Rhode Island Red Club erected this monument, anchoring an internationally important chicken to the town where it was developed. However, some controversy over its placement exists. The monument is in Adamsville on land donated by Deborah Manchester, nowhere near the Tripp or Wilbour farms in Little Compton. The monument has more to do with a culture of poultry fancying in the area than with the farmers who bred the chickens. In 1954, the same year that the Rhode Island legislature voted the Rhode Island Red the state bird, the Rhode Island Red Club and local residents installed a plaque at the location where William Tripp raised his famous chickens. You can still see the plaque, at the intersection of William Sisson Road and Long Highway. Both monuments are fitting testimony to an international poultry sensation whose chicks and eggs were shipped all over the world from Little Compton. VIDEO: A naturalist from the Massachusetts Audubon Society discusses the Rhode Island Red breed of chickens. 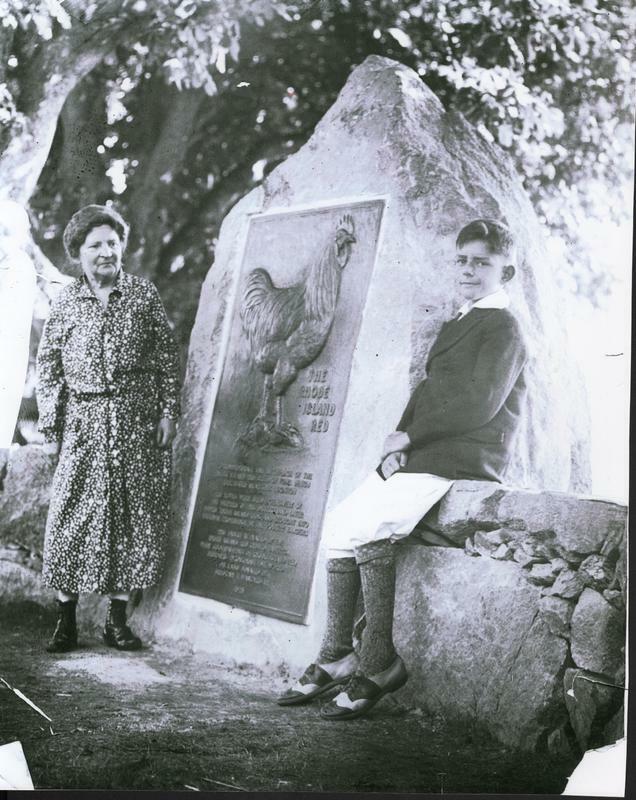 Rhode Island Red Monument : This monument was erected in 1925 by members of the Rhode Island Red Club to recognize Little Compton's role in the development of this important breed of chickens. The monument was constructed in Adamsville on land donated expressly for the purpose by Deborah Manchester. 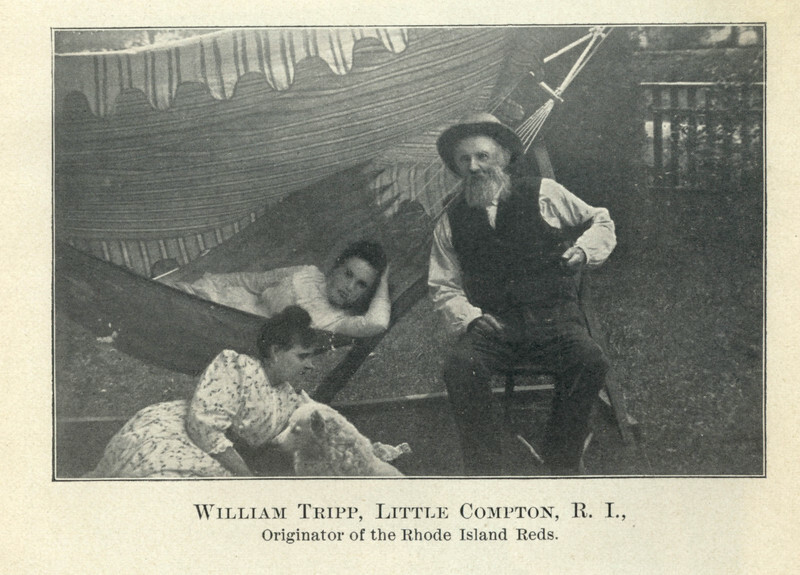 William Tripp : William Tripp was a Little Compton farmer who bred the first chickens of what later became known as the Rhode Island Red breed. 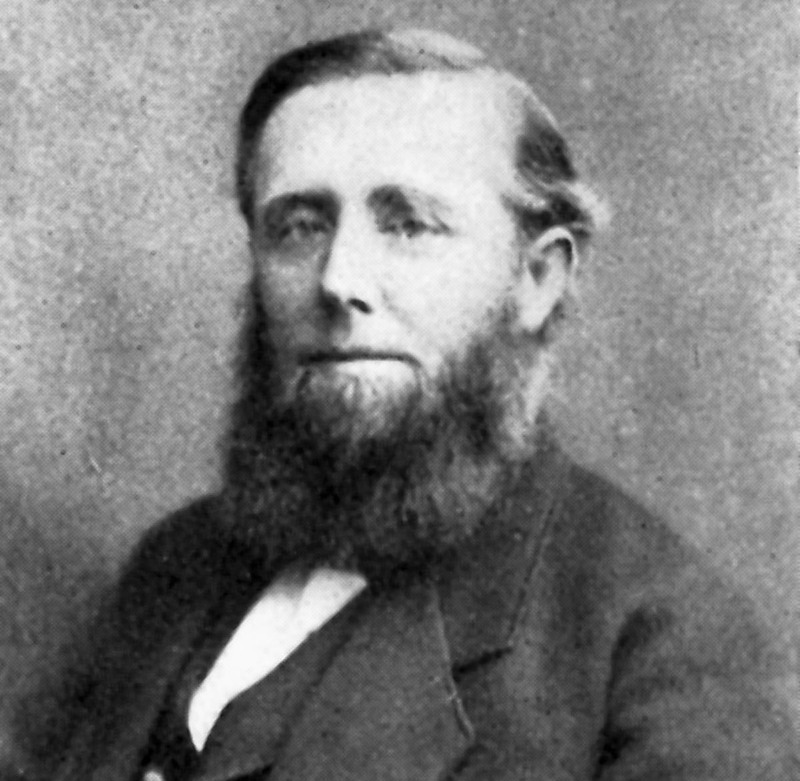 Isaac Wilbur : Isaac Wilbur, a poultry farmer from Little Compton, had the first large-scale poultry farm in the world and was also responsible for the naming of the Rhode Island Red breed. 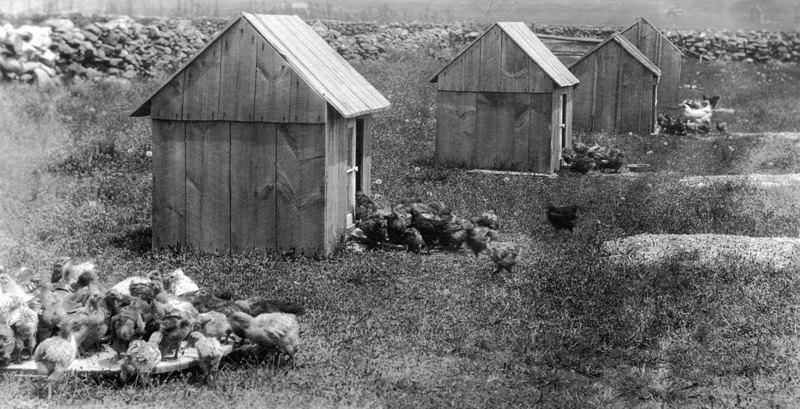 Rhode Island Red Chickens : Rhode Island Red Chickens were a common sight in many New England communities, including this unidentified farm in the Little Compton area. 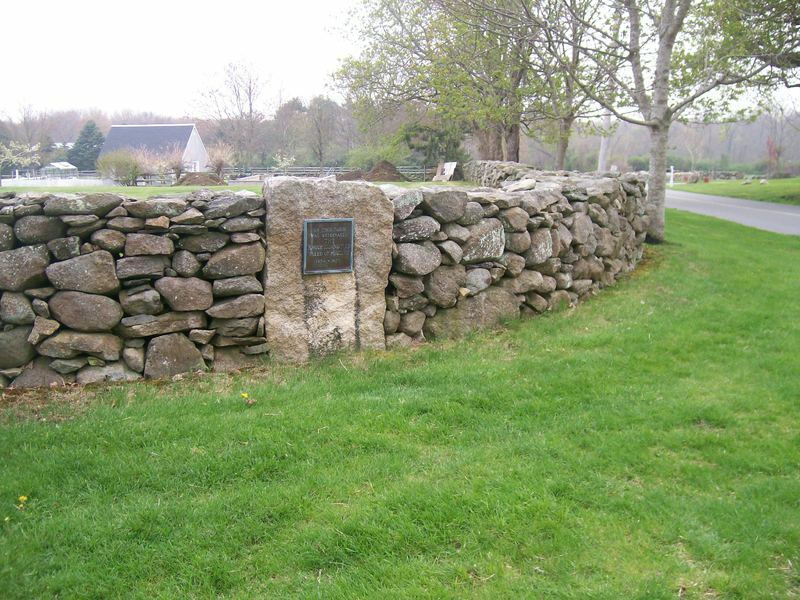 Rhode Island Red Monument : In 1954, a second monument memorializing the Rhode Island Red was constructed on the site of William Tripp's farm. As the first man to start crossbreeding chickens to produce what would eventually become the Rhode Island Red breed, William Tripp is acknowledged as one of the fathers of the Rhode Island Red. Abigail Ettelman, “The Rhode Island Red Monument,” Rhode Tour, accessed April 21, 2019, http://rhodetour.org/items/show/115.